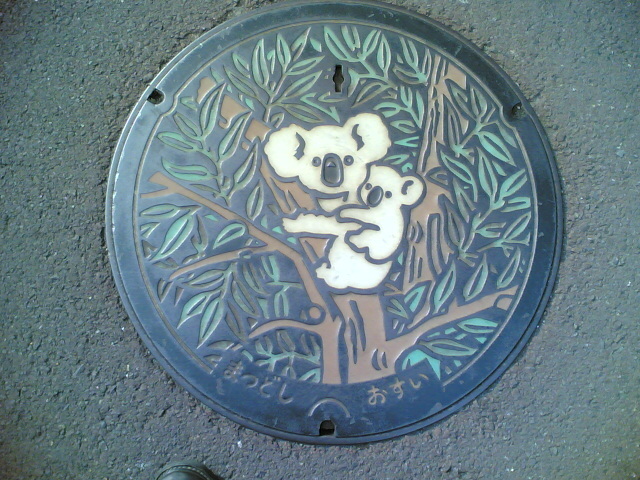 It is my dream to one day design a manhole cover. I have no idea how that might come about, but in the meantime, I’ve taken an interest the beautiful manhole I discovered whilst living in Japan. Like many things from Japan, they are finely designed and crafted, and sometimes wonderfully humorous. 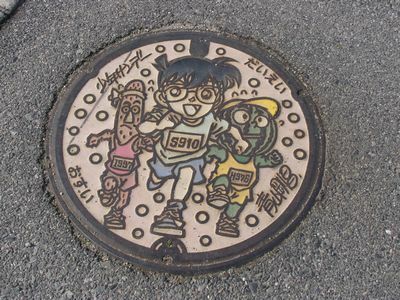 I’ve discovered some more nice examples of manhole covers here, and even more interestingly, an article explaining the origin of Japan’s colorful manhole covers at the Japan Times. Apparently, the covers were initially a way for central government to encourage small towns council to cover the cost of installing sewerage infrastructure, so making the covers unique and representative helped the small town politicians justify the costs to their constituents. They were so popular that bigger cities began to upgrade their own covers as well when the time came. Previous to the 1970’s and 80’s manhole covers were more conservative, and sometimes even direct copies of foreign manhole covers (I assume American?). hidden in a garden of an izakaya in nishi-Tokyo, probably Tanashi-cho. from a Japanese island, I think it was Miyake Jima. from Araichi, Arai-cho, an area famous for the fireworks basket carried by the man depicted. and again from Toyohashi, Arai-cho, a similar graphic with Toyohashi castle in the background. for those who are interested, many more amazing manhole covers from Japan can be found by image searching the phrase “mannho-ru “- manhole in katakana. Some of my favorites are below (not my photos, but the images link to their original source). … and in addition there is a wonderful series of manhole covers, which together tell a graphical story, here. Posted on Sunday, January 31st, 2010 at 1:04 pm in Uncategorized | | Both comments and pings are currently closed.